Prof. Howard M. Sachar, author of A History of Israel. Abraham Rabinovich arrived in Jerusalem five days before the Six Day War as a reporter for an American newspaper. He covered the battle for the city and was on the Temple Mount a few hours after its capture. To understand the momentous events he had witnessed, he subsequently interviewed 300 soldiers, officials and civilians. The conquest of the Old City, a major event in modern Middle East history, was something that Israel’s leaders had not planned and that some of them did not want. The book was written soon after the war, when memories were fresh. The current revised edition expands the context, political and military, and offers new perspective from both sides of the battlefield. With the outbreak of war with Egypt, Israel sought to avoid a second front. For hours after Jordan opened artillery fire, Israel refrained from substantive retaliation as it sought a cease-fire. Only after Jordanian troops penetrated the Jewish city did Israel respond on the ground, and even then in measured stages. The Israeli cabinet was divided over capture of the Old City. It was, surprisingly, the religious ministers who argued against it most vigorously. They feared that Israel could not stand up to international pressure if it annexed an entity that was not just the cradle of Jewish history but also sacred to Christianity and Islam. However, events created a vacuum on the West Bank into which Israel was inexorably pulled, step by step. We witness the heated debate in Jordanian military headquarters where King Hussein had handed over command of his army to an Egyptian general. The latter’s strategy was designed to meet Egypt’s needs, not Jordan’s. It would cost Jordan the West Bank. The book begins with a description of Jerusalem as a divided city, split between Israel and Jordan since Israel’s War of Independence. With the onset of the crisis in 1967, anxiety grips Israeli Jerusalem which had been besieged for months in the earlier war and elaborate emergency measures are set into motion. On the Arab side of the city, by contrast, there is euphoria and anticipation of an easy victory. Virtually nothing is done to prepare the civilian sector. The Israeli general staff pushes for a pre-emptive air strike against Egypt but the government resists. Tensions reach a point where at least one general, Ariel Sharon, considers the possibility of a putsch. The appointment of Moshe Dayan as defense minister opens the way to war. Defense of Israeli Jerusalem is entrusted to the Jerusalem Brigade, made up of local reservists. The greatest concern is Mount Scopus, an Israeli enclave behind Jordanian lines. An Israeli armored brigade is dispatched from the coastal plain with orders to reach Scopus by flanking the Jordanian line. It would have to breach thick minefields and scale difficult terrain as it races a brigade of Jordanian tanks coming up from Jericho. With time pressing, a paratroop brigade is ordered to relieve Scopus by driving through the center of the Jordanian defenses. The reader follows the gruelling battles in the trenches of Ammunition Hill and the streets of east Jerusalem through the eyes of the men who fought there. We see the growing isolation of the Jordanian garrison in the Old City, their last bastion. In a room lit only by distant flares, the Jordanian commander informs the local governor that he is pulling his troops out. A number of soldiers choose to remain and engage the Israeli troops from the alleys and ramparts of the walled city. A classic tale. “Thousands of books have been published on the never-ending Middle East Conflict but only a few dozen are worth reading. This is one of the latter. It originally came out decades ago but has now been expanded, revised and provided with maps and an afterword by Rabinovich. A journalist and non-academic historian of the old school—dogged, scrupulous, self-effacing—he possesses almost a novelist’s gift for plotting and for setting his real-life narrative and action in physical settings, in this caseJerusalem. His descriptions of men and women in the Arab half of the city, both soldiers and civilians, are fair and empathetic. Weaving among the characters on each side, both the obscure and those in leadership positions, he captures the explosive tension of those few days in June, 1967 when the conflict was reshaped but not resolved. The battle for Jerusalem goes on. Six Israelis skirted the border control post at the Mandelbaum crossing and entered the rear of a two-story building in no-man’s-land. The building in the heart of divided Jerusalem had once been a school for blind Arab girls but for almost two decades now it had served as headquarters of the Jordan-Israel Mixed Armistice Commission (MAC). Here every Monday morning officers from the two sides met around a horseshoe-shaped table presided over by a United Nations officer to discuss problems along the 400-mile-long border between their countries—camels or children strayed across the line, a broken sewer pipe in no-man’s-land. This, however, was a Sunday morning –May 14, 1967 — and the Israelis had been summoned to an emergency meeting requested by Jordan to protest the Independence Day parade scheduled by Israel in its half of the city the next day, the nineteenth anniversary of the founding of the state. Heading the Israeli delegation was Shaul Ramati of the Foreign Ministry. He had been attached to the regular five-man military delegation with orders to prevent any resolution condemning the parade — at least before it got under way in 24 hours. Ramati shook hands warmly with the head of the Jordanian delegation, Colonel Mahmud Daoud, whom he had known when the Arab was a young lieutenant in the early days of MAC. He asked Daoud to give his regards to the Jordanian official with whom Ramati had fixed the boundaries of Jerusalem’s no-man’s-land in 1951. The amenities over, Colonel Daoud stated his case. The parade, he said, would violate the armistice agreement since it would tend to confirm the status of Jerusalem as the capital of Israel. Ramati replied that the armistice agreement banned armored vehicles in the city but not parades. Only 1,500 soldiers would participate. The complaint, Ramati said, was “calculated to create artificial tensions”. The crusty New Zealand officer serving as MAC chairman, Colonel M.C. Stanaway, seemed to be leaning toward the Jordanians. Since Stanaway would cast the deciding vote, Ramati determined to keep the meeting going 24 hours to delay a vote. It was not until 9:30 A.M. Monday, just as the parade was getting under way from Hebrew University stadium, that the groggy negotiators at MAC House finally rose from their chairs. They had stormed at each other around the clock, taking a break of only a few hours about dawn. Stanaway had managed to draw up a statement that both parties could sign. In it the chairman agreed that the Jordanian complaint was outside the scope of the armistice agreement but said he could not support the parade because it would increase tensions. Walking back from MAC House, the Israelis found the head of the parade coming abreast on Jaffa Road, the city’s main thoroughfare. A large crowd lined the route, men carrying children on their shoulders. Ramati, unshaven and carrying his attaché case, stood on tiptoe to see the passing troops. Recently returned from posting abroad, Ramati had not seen an Independence Day parade in seven years. He started counting the soldiers to see if there were indeed as few as he had said there would be. Chief of Staff Yitzhak Rabin was also making calculations as he watched the last of the marchers file out of the university stadium. The general had been informed during the ceremony of unusual movements of the Egyptian army whose implications could not yet be gauged. A warning had come the night before, when he and his wife were attending a small gathering at the opulent Jerusalem home of former Venezuelan industrialist Miles Sherover. Also present were General Uzi Narkiss, head of Central Command, in whose area Jerusalem lay, and Yigael Yadin, the eminent archaeologist who had served as General Staff operations officer during the War of Independence in 1948. They were talking about the brigade that Rabin commanded in that conflict when the phone rang. The caller asked for the chief of staff and Mrs. Sherover led Rabin to a phone in the study. When he returned a few minutes later he lit a cigarette and rejoined the conversation, making no mention of the phone call. It had been from the head of military intelligence informing him that the Egyptian army would enter a state of maximum alert the following afternoon. Now, 12 hours later, Egyptian troops were reported crossing the Suez Canal in large numbers into Sinai. Rabin would be going through the events scheduled for the day with an ear cocked for the sounds coming across the desert. Only once every 19 years do the Hebrew and English calendars coincide. This year, for the first time since the state was founded, the anniversary was being celebrated on a May 15. Wood for bonfires had been assembled on the slopes above the Valley of the Cross, favored by youth groups, and downtown streets were strung with colored lights for the folk dancing scheduled after nightfall. Arye Hauslich, a news editor at the radio station, was on his way out to attend the mayor’s Independence Day party in the late afternoon when the teletype clattered with a news bulletin. Hauslich paused to watch the keys strike out a report about Egyptian troops passing through Cairo on their way out to the Sinai Desert. Puzzled as to what it meant, he included the report among the miscellaneous items to be read at the end of the news broadcast and headed for the party in the municipal rose garden. Jerusalemites, thousands of whom danced horas in the streets late into the night, went to bed exhausted from the day’s revelries unaware that the greatest crisis since the birth of the nation was already upon them. It had begun on the frontier with Syria, where border incursions and the shelling of kibbutzim had led the month before to an air strike on Syrian artillery positions and the downing of six MIGs. Incursions since then had only increased. In the first ten days of May, 11 sabotage attempts were reported, more than in the entire previous month. Prime Minister Levi Eshkol warned that action “no less drastic” than the April air strike might be resorted to if the raids continued. Warnings were also issued by Rabin while “informed sources” were predicting in the press that a major military strike would be undertaken unless the sabotage campaign was called off. The response to that warning had now come — not from Syria but from Egypt, the ostentatious movement of troop convoys through the heart of Cairo on Israel’s Independence Day. At first it seemed to Israelis to be merely routine muscle flexing to demonstrate Egypt’s support for her sister Arab state and to deter Israel from attacking her. Posturing seemed to be getting out of hand, however, when Egyptian President Gamal Abdel Nasser the next day demanded the withdrawal of the UN buffer force that had kept the Egypt-Israel border free of incident since the 1956 Sinai campaign when Israel invaded the Sinai peninsula in coordination with a British and French attempt to regain control of the Suez Canal. To Israel’s astonishment, the UN immediately complied with Nasser’s demand, and streams of Egyptian troops and tanks began to take up forward positions in the Sinai peninsula on the approaches to the Israeli border. On Wednesday, May 17, two Egyptian MIG-21s coming out of Jordan overflew the nuclear reactor at Dimona on a photo reconnaissance mission and escaped before Israel could react. It was a clear signal that Dimona would be targeted in the event of war. Israel began partial mobilization this day. Aaron Kamara, the owner of a driving school in downtown Jerusalem, was alerted by phone at noon. A major in the reserves, he commanded the lone tank company assigned to Jerusalem. His unit was a crisis barometer, always the first to be mobilized in the city when things grew tense. This could happen four times a year or more. His men grew weary of the repeated alarms which took them away from jobs and families from a few hours to a few weeks. “They cry wolf,” Kamara told them, “but someday the wolf will come.” Ten hours after the phone call ordering him to assemble his unit, Kamara and his men rendezvoused and set out for their camp. Under the armistice agreement tanks were prohibited within six miles of the border and so could not be stationed in the city itself. For a decade now the company’s World War II vintage Shermans had been kept hidden in sheds in the hills outside the city. Upon arrival, the men scrambled over the tanks which had been dormant since their previous call-up six months before. An hour after sunup the Shermans were fueled and loaded with ammunition. Kamara told his men to lie on the ground and get some sleep. The next day in Tel Aviv, the General Staff entered into emergency mode, activating the underground complex, the Pit, which could serve as a wartime command post. Jerusalemites had grown accustomed over two decades to living in a city divided between two hostile states. After a bitter battle, the War of Independence in 1948 had left the Jews in control of most of the city. But the Arabs had won the Old City and the Western Wall, that remnant of the ancient Temple compound to which Jews for two millennia had turned their faces in prayer. One of the top priorities of the Israeli government in the years after the war was to secure the tenuous hold it had won on the western half of Jerusalem and to flesh out the wedge of territory – the Jerusalem Corridor — which connected it to the coastal plain. The corridor stabbed deep into the Jordanian-held bulge on the west bank of the Jordan River. The Arabs had severed this lifeline during the war and the city came close to being starved into submission before the months-long siege was broken. At that time there had been only four Jewish settlements in the corridor. Although its rocky hills were poorly suited for farming, the government established dozens of new agricultural settlements to reinforce the Jewish presence, their lights riding the corridor’s hills at night like comforting sentinels. Where only one road had linked Jerusalem to the coastal plain in 1948 — and that blocked by the Arabs at Latrun — there were now alternatives. Jerusalemites whose nerves had been frayed during the siege left the city afterwards and the population of 100,000 dropped to 65,000, the same number as on the Arab side of the city. The Israeli government undertook a crash program for settling immigrants in Jerusalem and in 19 years the population trebled to 190,000. The population of Jordanian Jerusalem climbed to 90,000. The Jewish immigrants, most from Arab countries, were distributed along the city border, staking out Israel’s territorial claim with the same deliberateness that kibbutzim were planted along the country’s hostile frontiers. While the Jordanians had laced their side of the border with bunkers and trenches, the Israelis put up housing developments on their side. These border structures were designed to double as battle positions in time of war. Apartment buildings with walls three times normal thickness and firing slits on the roof were placed on the very edge of no-man’s-land facing the enemy positions, the other buildings in the development sheltering behind it. Windows in the front building were built high in the wall to make it more difficult for a housewife to be picked off by a sniper as she dusted her furniture. Residents were even provided with metal, anti-sniper shields to be placed in the front-facing windows when the border heated up. Nevertheless, one or more civilians were shot dead along the border almost every year. The strategic use of residential buildings was most striking in the south of the city where an entire neighborhood was thrown up in a giant arc to shield the government center from Jordanian positions. Jerusalem lacked the cosmopolitan night life of Tel Aviv or the industrious bustle of Haifa, both larger. Women’s fashions in Jerusalem were usually a year behind Tel Aviv. In Jerusalem, unlike Tel Aviv, drivers almost always halted for pedestrians at crossings and pedestrians waited for green lights even on trafficless streets. The gentle pace suited a city that was one of the most beautiful and serene in the world. Built of the same tawny stones as those covering the hills surrounding it, the city was itself part of the landscape. Tourists generally stayed in Tel Aviv and came up to Jerusalem on day trips. At Christmas, Christian pilgrims would stream to the holy places on the Jordanian side of the city through the Mandelbaum border crossing on the Israeli side. Jewish Jerusalemites sometimes drove to the southern edge of the city on Christmas Eve to hear the bells of Bethlehem. Jordanian Jerusalem was likewise a provincial backwater. The Hashemite kings gave priority to development of the east bank of the Jordan, the seat of their power, although Jerusalem’s Old City, with its holy places and history, remained a tourist draw. The preponderence of poor immigrants from Islamic countries, on one hand, and of university and government people on the other, gave Israeli Jerusalem an oddly balanced population. The element which gave the city its most distinctive flavor was the ultra-religious community, particularly the hassidim, whose dress and customs reflected a centuries-old way of life derived from Eastern Europe. It was from this diverse population that the army unit entrusted with the defense of the city, the Jerusalem Brigade, was drawn. Except for a small cadre of regular officers the brigade was composed of reservists. Many were from Hebrew University, which had 12,000 students.The commander of the brigade, Colonel Eliezer Amitai, was a regular army officer recently returned from a stint as attaché in Washington. The brigade was also responsible for defending the 20-mile-long Jerusalem Corridor, linking the city with the coastal plain and Tel Aviv. Because the railroad line to Jerusalem passed through two Arab villages, the armistice agreement stipulated that the half of each village straddling the tracks be placed on the Israeli side of the frontier. One of the villages, Bait Safafa, was within the Jerusalem city limits. When there was a marriage on one side of the village, the wedding party would come down to the border to celebrate with the rest of the clan, each group confined to its side of the border fence. The greatest anomaly was the Israeli enclave on Mount Scopus on the Jordanian side of the city. During the British mandate, the two best-endowed Jewish institutions in Palestine — Hebrew University and Hadassah Hospital — were built atop the historic hill. At the end of the War of Independence, the Jews still held Scopus, but the Arabs controlled the Sheikh Jarrah residential quarter that separated it from Jewish Jerusalem. Under the armistice agreement, Israel was permitted to keep 85 police and 33 civilians on Scopus, ostensibly to look after the maintenance of the hospital and university buildings. It was common knowledge that all the men were in fact soldiers, mostly reservists doing their annual stint. Every second Wednesday morning a convoy under UN supervision was permitted to pass through Sheikh Jarrah to bring up supplies to Scopus and rotate the garrison. The convoy paused at Mandelbaum Gate where UN officers checked the supplies, opening cans and packages pointed to by Jordanian officers. The Jordanians, who were forbidden to touch the supplies themselves, believed the Israelis were trying to smuggle weapons onto the hill. Suspect items were not permitted to go up. After the inspection, the Israeli soldiers would board two buses covered with armored plate except for the driver’s slit. The soldiers were unarmed because the only weapons permitted in the enclave were the 120 World War II rifles and Sten guns in the garrison’s possession when the War of Independence ended. Jordanian soldiers carrying rifles took places in the front and rear stairwells; their weapons were empty, but they carried loaded magazines in their pockets. Between each Jordanian and the unarmed Israelis stood a UN officer. The Jordanians descended before the buses entered the Scopus enclave. There were rumors, brought back by reservists who served on the hill, that supplies were being smuggled up to Scopus at night through the Jordanian lines. Some reported seeing jeep tracks near the barbed-wire perimeter in the morning. Others reported that local Arabs had been bribed to bring up supplies on the backs of donkeys. There was talk of a tunnel between Scopus and Israeli Jerusalem, a mile to the west. Some reservists were convinced that United Nations personnel were bribed to smuggle up weapons in their vehicles. The spread of such stories was encouraged by the small regular army cadre on Scopus because they helped cloak a real smuggling operation — one more brazen than the one the reservists thought they had stumbled on. Supplies were indeed reaching the hill, and in far greater measure than imagined. The Israeli command, fearful that the lightly armed garrison would be overrun in a future conflict, had in the late 1950s converted the two armored buses into Trojan horses. A half-meter-high false roof was fitted onto the larger of the vehicles, providing enough space even for dismantled anti-tank recoilless weapons. The roof could be raised by removing the two ceiling fans and cranking open the bolts thus exposed. In both buses, space was provided between the exterior armor plating and the inside walls to accommodate ammunition and mines. The mines were critical to the Scopus defense plan. Laid at night over the years, they provided the garrison with a thick protective shield. The presence of UN officers on the buses mitigated only slightly the reservists’ feeling of vulnerability as the buses passed through the Jordanian part of the city, particularly the Sheikh Jarrah Quarter. In 1948 a convoy of buses and ambulances on its way with medical personnel to Hadassah Hospital had been ambushed there, resulting in more than 70 dead. The soldiers would have felt somewhat better had they known that under their seats were secret compartments containing submachine guns, each with a loaded magazine and grenade alongside it. If the fire extinguisher at the front of the bus were removed, a sack of grenades would have been revealed. Aboard each bus was a member of the Scopus cadre who could reveal the weapons caches in case of ambush. After reaching the Scopus enclave, the reservists were dropped off and the buses driven into a sheltered area where they were unloaded by the permanent cadre. If reservists should learn of the presence of secret arms caches during their stay, they would attribute it to one of the imaginary “smuggling routes” hinted at by the disinformation specialists. For the garrison, the isolation of Scopus duty was tempered by the view. On one side of the ridge was Jerusalem, on the other the Judean Desert. With binoculars, some soldiers could see their own homes. Over the years, the hospital and university buildings became sad-looking shells as weather and age took their toll. Both institutions had established new facilities in west Jerusalem. On the Central Front that General Narkiss commanded — an area stretching most of the distance between Haifa and Beersheba — it was Mount Scopus that concerned him most as the post-Independence Day tension mounted. Narkiss was confident that the Jerusalem Brigade could hold off any attack the Arabs might stage in the city or the Jerusalem Corridor. But if Scopus were attacked, he did not believe that the brigade, half of whose men were over 35, could break through the defenses the Jordanians had built up over the past two decades. Without help, the garrison on the hill could not long hold out against a determined assault. Narkiss also considered the possibility of an Arab attack on an isolated settlement in the Jerusalem Corridor or on the vital waterworks at Rosh Ha’ayin near Tel Aviv. He had adequate forces to cope with such scenarios. More serious was the possibility of a major attack in the Netanya area north of Tel Aviv, where the Arabs had only to push nine miles to reach the sea and divide Israel in two. If that happened, the General Staff would take direct control and shift forces there from other fronts. However, if Scopus were attacked Narkiss would have to rely on his own slim resources. Most of his artillery had been sent at the beginning of the crisis to Southern Command, opposite Egypt. So few guns did he have and so limited was their ammunition that he could not hope to lay down a protective barrage around Scopus sufficient to break up a sustained attack. Central Command’s main reserve force was a mechanized brigade, the 10th (Harel) Brigade, deployed on the coastal plain. The 10th Brigade’s old Sherman tanks would probably have to contend with a brigade of more modern Patton tanks the Jordanians had deployed near Jericho, 18 miles east of Jerusalem and 3,500 feet lower. If war came the fate of Scopus could be decided by a race between the two tank forces, starting on opposite sides of the Judean Hills, to Jerusalem crowning the heights. Narkiss estimated it would take the Pattons eight hours to reach Scopus. He was counting on the Shermans to reach the Ramallah-Jerusalem road just north of Scopus in 12 hours, an optimistic estimate considering the distance and terrain they would have to cover, the dense minefields they would have to breach, and the resistance they would have to overcome. Until relieved the Scopus garrison would have to hold on with the antitank weapons that had been smuggled up. Despite the partial mobilization, the prospect of war with Egypt did not at first seem likely to Israeli decision makers. Military intelligence’s assessment for years had been that Nasser was not ready for war with Israel. He appeared even less ready now because 70,000Egyptian soldiers were bogged down in Yemen, supporting one of the sides in a civil war. However, the accelerating pace of events in the days after Independence Day caused the chief of military intelligence, Gen. Aharon Yariv, to make a hasty reassessment. On Friday, May 19, four days after the parade, he told a meeting of the General Staff that his previous evaluations were no longer relevant. The new Egyptian deployment in Sinai was not just defensive, as he had said only the day before. It could also serve as a springboard for offense. Nasser’s intentions were unclear but he appeared to be preparing for confrontation, said Yariv. His demonstrative move into Sinai had been meant to deter Israel from striking at Syria. But Nasser now appeared to be seeking to exploit the crisis for strategic reasons that went beyond commitment to an ally. The Dimona overflight, the massive buildup in Sinai, the expulsion of the UN peacekeepers, Nasser’s belligerent statements were not just a warning but a challenge. One possibility, said Yariv, was that Nasser had received an appraisal that the nuclear reactor at Dimona was about to be activated. He might be feeling strong enough, Yariv conjectured, to be ready to engage Israel in war, even one in which Israel got in the first blow, as long as Egypt could strike at the Dimona reactor and end the threat of nuclear weapons in Israeli hands. Five days after Israel’s partial mobilization, the senior officers of a still unmobilized reserve paratroop brigade, the 55th, were summoned to a briefing by the unit commander, Col. Mordecai (Motta) Gur. If Nasser closed the Tiran Straits to shipping bound for Eilat, said Gur, it would mean war. He pointed out on a map the deployment of the Egyptian forces in Sinai and explained the brigade’s likely role if war broke out. To Captain Dan Ziv, a deputy battalion commander, the statistics of enemy strength in Sinai were grim – 80,000 men, 800 tanks. But as he examined their disposition, he saw an imbalance he knew the Israeli High Command would exploit. He got home late at night and was shaken awake by his wife at 10 A.M. with the news that the Straits of Tiran had been closed. In a film showing at Hebrew University that night, Yankele Rotblit, a reserve lieutenant in the Jerusalem Brigade, was watching The Longest Day, about D-Day in Normandy, when someone opened the door and shouted a name. In the darkened room, a figure rose and hurried out. A few minutes later another name was called. Rotblit realized it was general mobilization. As soon as the movie was over he hurried home and found his call-up papers waiting for him. That night, all through the country, military couriers rang doorbells and handed reservists orders to report to their unit assembly point in the morning. If the man was out, a notice was pasted on his doorway. It was a drill the country’s 215,000 reservists practiced two or three times a year, sometimes being routed out of bed at 2 A.M.
Aaron Shai, a newly married schoolteacher, was at home with his wife when a woman arrived with a wedding gift. She had just sat down when the bell rang again. Aaron opened the door to a friend who served in the same reserve unit. Seeing the gift on the coffee table, the friend said, “I came with a wedding present too,” and handed Shai his mobilization papers. After preparing kitbag and boots, Shai went to bed but found it impossible to sleep. He could hear men calling to each other from the balconies of neighboring houses—”Did you get your notice yet?” On the normally quiet street there was a periodic burr of tires as cars rushed by bearing mobilization couriers. Many of the vehicles were taxis which had themselves been mobilized together with their drivers. Every so often couriers mounted the steps in Shai’s building. The last doorbell rung was that of the dentist who lived in the next apartment. It was 3:30 A.M. but the dentist opened immediately. When he said goodnight to the courier and closed his door, Shai fell asleep. Attorney Johnnie Hyman had been planning to drive down to Tel Aviv the following morning to represent a defendant in a criminal case but the sound of the doorbell told him that his legal career was suspended. Hyman’s cool, intelligent features suited his role as battalion staff officer as it did courtroom counsel. Before he returned to defending accused criminals, he would learn what it is to kill a man in hand-to-hand struggle. Around the country the men of Col. Gur’s paratroop brigade, most of them residing in kibbutzim and other rural settlements, were being collected this night. They had been waiting impatiently. The closing Arab ring had aroused in them the deepest instincts of self-preservation, personal and national. Indifference, pacifism, and political differences gave way before a universal conviction that there was only one way out now — by war. In the village of Even Yehuda, a pleasant community of Romanian and Yemenite immigrants near Netanya, more youngsters than usual crowded into the clubhouse for the regular Tuesday night folk dancing session. The instructor was Sara Lapid, a vivacious farmer’s wife who had been among the 4,500 illegal immigrants aboard the Exodus in 1947 whom the British shipped back to Germany. She stood in the center of the dance floor and watched the young people whirl around her with a frenzy she had not seen before, venting the tension they all felt. From time to time a name would be shouted from the doorway and a young man would hurry out. When the session ended, Sara waited outside for her husband to pick her up. She still had not learned to drive a car, but her husband had started giving her lessons on the tractor which she would have to operate after his mobilization. Waiting with her was Naphtali Cohen, a dark-skinned youth of Yemenite descent. A private in Gur’s paratroop brigade, Cohen had grown increasingly impatient during the night as others at the dance were summoned. To Cohen’s distress, several buses filled with reservists passed without stopping. He was about to head home on his motor scooter when a half-empty bus approached slowly, as if the driver was looking for a street. Cohen flagged it down. “Are you looking for Naphtali Cohen?” he asked. To his surprise an officer aboard said yes. Cohen asked a friend to take his scooter home and tell his parents he had gone to join his unit. Spurning the officer’s suggestion that he go home himself to say good-bye, Cohen leapt aboard the bus. At kibbutz Tsuba in the Jerusalem Corridor, Uri Hermeling had been expecting the call-up since hearing the news of the Tiran closing on Radio Cairo’s Hebrew language broadcast at 5:30 A.M. which he had been listening to since the crisis began. At dinner he and the other kibbutz members belonging to Gur’s paratroop brigade sat together in the communal dining room. People came over from other tables to wish them well and exchange banter. For Hermeling it was a togetherness he would rememer. The kibbutz women gave them boxes of candy and fruit before they boarded the bus. At Kfar Blum, a kibbutz in the Upper Galilee founded by settlers from English-speaking countries, 21-year-old Bitan was on guard duty when the telephone rang at midnight. The caller, from Gur’s brigade, asked him to waken Yair, a reservist lieutenant responsible for assembling the men from the unit at the kibbutz. Bitan himself was a paratroop officer, but he had just completed his regular service and had not yet been assigned to a reserve unit. He asked the officer on the phone if he could come along to Gur’s encampment. The officer said he would find out and call back. Running to Yair’s apartment, Bitan rapped on the door and entered. Yair’s bag, he saw, was already packed. “It’s finally come,” Bitan said. Twenty minutes later the officer from brigade called back and told Bitan he could come along. Gathering in the dining hall, the men drank coffee from the urn kept filled for the men on night guard duty. When the bus arrived, paratroopers from neighboring kibbutzim were already aboard. In nearby Kfar Szold, Dov Stolar was wakened at 1:30 A.M. and told to join the reservists from Gur’s unit in the dining hall. A bachelor, Stolar normally had a room to himself but since the crisis began two men had been sharing it with him. Their assigned position on the kibbutz defense perimeter was nearby, and they had to be close to it in the event of a night attack by the Syrians from the adjacent Golan Heights. Stolar was careful not to disturb them as he dressed. On board the bus he found himself sitting next to the man in charge of alfalfa irrigation. Stolar himself was in charge of irrigation in the cotton fields. The two had been planning to swap irrigation pipe Thursday. In the cotton fields pipes are dragged across the ground. Stolar’s were battered now and no longer suitable for such rough treatment. They could, however, be used in the alfalfa fields where the pipes are lifted by hand. “I don’t think we’ll be changing pipe this Thursday,” said Stolar. In his kitbag he had tucked a copy of “The White Nile”. There might be a chance, he thought, to see how the Egyptians water their cotton before he got back. The threat of war raised in Jerusalem the specter of 1948, when the besieged city had nearly been starved into submission. Per capita consumption was reduced to 900 calories a day, one-third adequate intake. When the siege was finally lifted only three days’ supply of flour remained. Assured by the military that any future war would be over quickly, officials of the Ministry of Commerce and Industry in 1958 finally dropped rationing. In its place they adopted a bold policy of “overflow” — keeping so much food on hand that people could buy as much as they wanted. The policy was made possible by the increase in the country’s agricultural production. The food industry was already processing far more than it could market within the country. Staples were warehoused in sufficient quantities to supply Jerusalem’s population for more than half a year, even if the city was completely isolated. The water situation had also improved radically since 1948 when the solitary pipe bringing water from the coastal plain was cut by the Arabs for 96 days and the city had been forced to survive on stored water sparingly ladled out. Two mains now connected the city with the national water grid and municipal water officials were confident they could manage even if these were cut. In 1949 ample water supplies were discovered when test borings were made for a small dam just outside the city. Houses in Jerusalem since ancient times were built with cisterns to trap and store winter rains. New houses were still required to be built with cisterns as a reservoir in case of war. As the crisis intensified, the municipality dispatched men to knock on doors and advise householders to fill empty cisterns with piped water. No public announcement was made to avoid creating panic. The water department staged drills in which a deputy would call in hypothetical problems – “The 18-inch pipe has been broken at these coordinates, power is out on the northern line. What do we do?” The manager would have to devise emergency procedures on the spot. These exercises would prove themselves shortly. In its eagerness to provide housing during the years of mass immigration, the Housing Ministry had ignored a municipal ordinance requiring all new buildings to be built with shelters. The city found itself now with no shelters for 40 percent of the population. Following the closing of the straits, volunteers turned out in the thousands to dig trenches that could serve as emergency shelters. Residents calling the municipality for advice about preparing shelters in their homes were told to choose the lowest room in the house and to block its windows with sandbags. One resident was visited within three hours of his call by an engineer carrying a plan of the house which was on record at City Hall. After examining the room chosen, the engineer said, “This will serve for anything but a direct hit. The beams will provide support if you’re hit upstairs. Fifty sandbags along that wall will do the trick.” With a parting “Be healthy,” the engineer moved on to the next address. At the request of the Foreign Ministry, the municipality dispatched engineers to embassies and consulates. Latin Americans, who had never experienced war, didn’t know where to begin. The Europeans, on the other hand, already had their premises properly sandbagged and stocked with provisions. The municipality ordered a fleet of trucks to dump sand from a quarry onto street corners. Burlap sacks acquired from sugar factories were made available at nominal cost in groceries. The sight of housewives moving ant-like through the streets lugging pails of sand prompted Aviva Yeriel to call the women in her apartment building together for a meeting. Aviva, a fighter in the War of Independence and now a mother of four, told her neighbors it was time to prepare the building for war. Most of their husbands had already been called up and the remainder were likely to go soon. The women decided to clean out the shelter, which was being used as a storeroom, and stock it with water. They might be spending weeks there and Aviva volunteered to whitewash the walls and hang cheerful curtains. The women agreed to ask the remaining men to install an electrical outlet so water could be heated for the infants. Similar meetings were going on throughout the city. Unknown to residents along the border, plans existed to evacuate them in the event of war. Schools and other public buildings had been designated as evacuation centers capable of accommodating 20,000 people for several months. There would be no evacuation, however, until war was clearly imminent. In schools, homework was kept to a minimum so as not to add to the stress. Teachers discussed the news to alleviate anxiety which might develop from rumor. At the Geulim School in the poor neighborhood of Baka, girls in sewing class turned burlap sacking into sandbags. These were filled with sand from the school playground, the first-graders joining in the effort. The children were asked to bring blankets and candy from home to be stocked in the shelter. At Hebrew University, the task of organizing the campus for war fell to the chairman of the Bible Department, Professor Shmaryahu Talmon, a reserve infantry captain and a respected scholar. Although he had been teaching there for years, Talmon found himself discovering the innards of the university for the first time. At a meeting with the heads of the science departments, he learned that there was enough explosive material on hand to destroy a good part of the campus. He ordered the material removed to a remote area and sandbagged. Talmon was amused at the sight of scholarly colleagues lugging sandbags and fire hose to the library, where they had been posted to the emergency fire brigade. More than 1,000 foreign students, including Africans and Asians, volunteered to work on kibbutzim to replace men who had been mobilized. Others volunteered in hospitals, factories, and institutions in Jerusalem itself. Two American students camouflaged a rented car with mud and made themselves available to Talmon as couriers. In the Physics Department, 22 of the lab assistants had disappeared into uniform. The three personnel remaining devised a makeshift liquid-air device capable of producing oxygen to supply the city’s hospitals in the event Jerusalem was cut off. Abdullah Schleiffer, a Jewish convert to Islam living in Jordanian Jerusalem, was appalled at the light-headed confidence all about him. “The atmosphere was magical,” he would write. “No one did anything but stand around, congratulate each other and praise Nasser. Somehow, this one man, by sheer weight of his audacity, was going to overwhelm the enemy in an amazing manner.” The Long Island-born Schleiffer, who worked as editor of the English-language Palestine News in Jordanian Jerusalem, found the buoyant mood bizarre, as if rhetoric alone could deal with the war about to descend upon them. Following an appeal made by Radio Amman, a local newsman went to the Red Crescent in Jerusalem to donate blood. The place was empty and the director, puzzled at the newsman’s presence, asked whether there had been an accident in his family that required a donation of blood. Residents chortled at reports from Israel of panic-buying but no one on the Jordanian side of the city was taking steps to stock up on food, designate shelters, collect blood, or prepare hospitals for the possibility of mass casualties. Civil defense equipment consisted of little beyond armbands. Only the Jordanian municipality took emergency steps like checking water and fuel supplies and sandbagging water pumping stations and other facilities. Although Jordanians were not sure whether war would actually break out, there seemed to be no doubt in anyone’s mind what the result of such a war would be — swift victory and the destruction of Israel. A middle-aged Jordanian businessman from a leading Jerusalem family with a reputation as political moderates (the businessman had indulged his own liberal views by having a Jewish mistress during the Mandate) spoke gleefully of the prospect of war when he ran into Schleiffer, who was covering Shukeiry’s visit to al-Aksa. “If war comes we will finish them,” he told the newspaperman. “I’ll take you into the New City (Israeli Jerusalem) and we’ll have their women.” In his book, The Fall of Jerusalem, Schleiffer wrote “Arab confidence hung in the air like some horrible omen.” It was a lazy, dreamlike confidence that rested entirely on Nasser’s charisma. “No one seemed to even consider the logic of modest hoarding,” wrote Schleifer. The pressroom of his own newspaper, he noted, employed six fit men, none of whom knew how to work a rifle. For Israel, even the prospect of victory was grim. Six thousand Israelis, one in every 100, had died in the War of Independence, a conflict that had seen little air action. When Israel went to war again in 1956 it had been on only one front and in cooperation with England and France. Even so, then Prime Minister David Ben-Gurion insisted that France post air squadrons in Israel to protect its cities from Egyptian air strikes. Israel now stood alone against a coalition of Arab states which had among them three times as many tanks and planes as Israel. In the Tel Aviv area, digging began secretly of 10,000 graves. Moshe Dayan, who was chief of staff during the Sinai campaign, envisioned thousands of dead in the coming conflict. “An entire generation of paratroopers and tank men will be lost,” he told General Yeshayahu Gavish, head of Israel’s Southern Command, “but you will win.” Despite the dire prediction, Gavish found solace in Dayan’s remarks because he at least predicted victory. Not all leaders were sure of that. Chief of Staff Rabin was pushed to the edge of nervous collapse by the responsibility that had fallen on him. His recommendation to go to war could lead to appalling losses if he had calculated things wrongly. This responsibility would normally have been shared with the defense minister, but the defense portfolio was held by Prime Minister Eshkol. Although a wise and amiable man, Eshkol did not have Ben-Gurion’s background as a war leader, nor his decisiveness, nor his personal charisma. When Rabin was summoned to cabinet meetings, he sensed that Eshkol and the other ministers were looking to him not just for a professional assessment and a list of options but for decisions about which options to adopt. In search of reassurance, or at least an insightful strategic analysis that he was not getting from Eshkol, Rabin called on Ben-Gurion on May 21. It turned out to be the most traumatic meeting of his life. The former premier was as decisive as Eshkol was hesitant, but his decisiveness lay in warning against going to war without support of a foreign power. Otherwise, it would be an adventure that risked national disaster, he said, and the responsibility would be Rabin’s. The chief-of-staff had made a grave mistake, said Ben-Gurion, in ordering mobilization and thereby accelerating the war momentum. Rabin was shaken by Ben-Gurion’s remarks which reinforced his own concerns. His commanders spoke confidently of swift victory. But Rabin could not be certain that their predictions would prove realistic when put to the test. Against this uncertainty, Ben-Gurion’s powerful “thou shalt not” was a warning Rabin could not shrug off. Ben-Gurion had proved prophetic in the past. If he was correct now, Rabin could be leading the nation to another Holocaust. For Israel, the closure of the straits was a clear causus belli. To let it pass without a strong military response would be a devastating sign of weakness. Washington asked Israel not to send a ship through the straits for 48 hours while the U.S. attempted to resolve the matter by diplomatic means. In the mood of indecision that prevailed in Israel, the American request offered a welcome respite. Foreign Minister Abba Eban was dispatched to Washington to assess sentiment there. That evening, Rabin called General Ezer Weizmann, head of Operations on the General Staff, and asked him to come to his home. Speaking candidly of the strain he was under, Rabin asked Weizmann whether he believed that he, Rabin, should resign. Weizmann, a former air force commander, persuaded Rabin that he needed only a brief rest. Word was put out that Rabin had been temporarily incapacitated by nicotine poisoning and Weizmann took over as acting chief of staff. A few nights after the closing of the straits, Chaim Yavin, a broadcaster at Kol Yisrael (Voice of Israel), the government radio station, was asked to report there immediately. Before the night was over, Yavin — who would become the main news anchor on Israel Television for four decades — and a dozen colleagues were given a quick lesson in operating a tape recorder and dispatched to combat units as war correspondents. The radio had become the most important element of cohesion in the country. The six high-pitched beeps announcing each news bulletin could be heard in banks, schools, cafes, and trenches. Hanoch Givton, Kol Yisrael’s director, felt that a reassuring voice needed to be heard to ward off national despondency. His choice was General (reserve) Chaim Herzog, a former head of military intelligence who had given a well-received broadcast on Vietnam after a visit to that war-torn country. Dublin-born Herzog was the son of a former chief rabbi of Israel. Herzog accepted Givton’s offer to serve as a military commentator. His daily broadcasts – offering upbeat analysis shorn of overt propaganda — were to exercise an immense calming effect on the public. Kol Yisrael’s Arabic network was attempting to produce precisely the opposite effect on its listeners in the surrounding Arab countries. If it came to war, the announcers warned, the results would be even more disastrous for the Arabs than the Sinai campaign. A Nasser speech just prior to that conflict, in which he said Egypt was ready for war, was rebroadcast. “What assurance do you have that he is any more ready now?” Kol Yisrael asked. On May 26, two Egyptian planes entering from Jordan made a second high-altitude photo reconnaissance of the Dimona reactor. I was a journalist on Long Island when tensions in the Middle East began to escalate in mid-May 1967 with the movement of the Egyptian army into Sinai. With war seeming more likely with each passing day, I informed my editors that I intended to travel to Israel. They agreed to consider my departure as annual leave. If there was a war I would file stories. But war or no war, I was to be back at my desk in two weeks. Five days after my arrival in Jerusalem the war began. Six days later it was over. I still had three days before my scheduled flight back. Sitting at an outdoor café and looking down the street towards the walled Old City, I could see the air shimmer from the heat rising from the asphalt. The shimmer seemed a metaphor for the vibrancy of the time and place. Post-Six Day War Israel was just too interesting to leave. I notified my editors that I would not be returning. My intention was to stay for a few months and watch history play itself out until my savings ran out. My sister lived in Jerusalem so I had a ready-made pad and social milieu. After a few weeks, however, acquaintances began to ask what I was planning to do. “Just hang around” seemed an inadequate reply. To account for my presence I decided to tell people I was writing a book and to even begin working on one. The country was awash with the world’s top journalists and I presumed the war was already being written about from every conceivable angle. 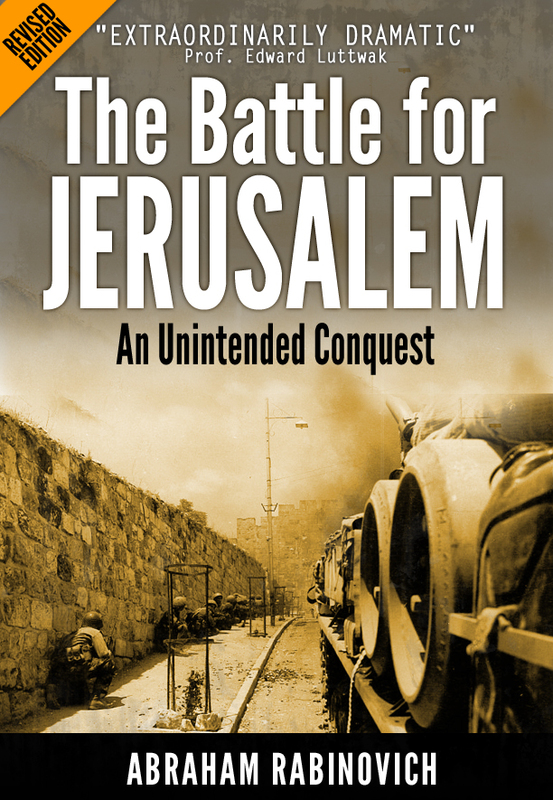 I chose a soft niche that might be too trivial for others to bother with – how the residents of Jerusalem had experienced the battle. Enrolling in an intensive Hebrew language course, I soon began interviews. Almost all the adult males in the families I spoke with were members of the Jerusalem Brigade, the home guard unit which had fought in the war. To give their stories context, I found myself seeking out more senior officers. It soon became clear that even they had only a limited view of events. Intrigued now, I abandoned my civilian-oriented approach and decided to aim for the comprehensive story of the battle from the Israeli side, irrespective of what any other author might be writing. I had no direct access to Jordanian military sources and would have to rely on published accounts for that side of the story. In addition to The Jerusalem Brigade, the battle involved an Israeli armored brigade and a paratroop brigade. The bulk of these soldiers lived around the country. I would conduct close to 300 interviews over two years. Of the paratroop brigade, which bore the brunt of the fighting, I interviewed 125 officers and men, in the course of which I visited 35 kibbutzim and agricultural villages, sometimes following the sound of a tractor in the field to find the reservist I was looking for. In the course of the interviews I encountered for the first time the Rashomon phenomenon where people who witness the same event give conflicting accounts. Men sometimes remembered things that never happened and they were frequently blank about things that did. Time was often telescoped or reversed by the shock of battle and memory distorted. Whenever I had conflicting testimony I sought out other members of the unit until I could obtain overlapping accounts, which is why I interviewed so many. The first edition of the book was published shortly after the war but over the years new revelations would emerge about the Israeli and Jordanian protagonists as well as the regional and international context. The current edition with its new subtitle, An Unintended Conquest, reflects this evolving historical perspective. But the basis of the book – the ground level account of the battle itself – rests still on those post-war interviews.